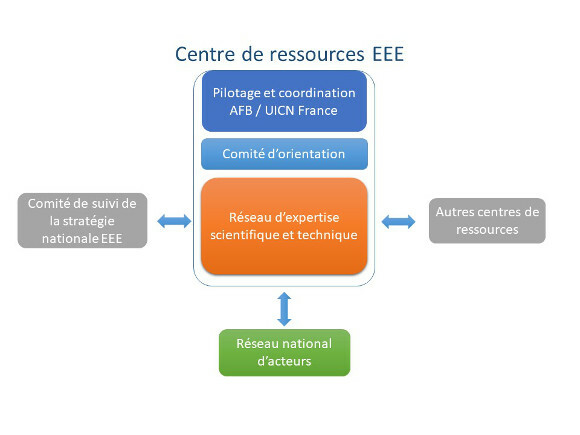 The French IAS Resource Center is co-led by AFB and IUCN France. To guide its actions, identify needs in terms of knowledge dissemination, tools development and training, the IAS Resource Center mobilizes a steering committee and a network of scientific and technical expertise (REST). It also runs the national network of stakeholders on IAS, which is the main beneficiary of the tools and information provided by the IAS resource center. The IAS National Strategy Committee, coordinated by the Ministry in charge of Ecology is a consultative body for the IAS Resource center, which regularly informs it of its activities. Finally, interactions are being established with other existing resource centers (ecological engineering, TEMEUM, etc.) to develop synergies and to develop common tools.